My sister-in-law seemed determined enough when she recommended a place to get lunch last week. I found no reason to protest. We drove to A Szűcs Fogadója, located half way between Gödöllő and Szada about a half hour road trip from Budapest. It’s a tavern-type establishment with not the most scenic of surroundings – a busy highway and a parking lot, but a parking lot packed with cars even at lunch time on a random weekday. Good sign. And yes, the place certainly seems to have a following around town and even among the harder-to-please urbanites of the nearby capital. The quality is known to be consistently good and worth even the drive from da big city. My sis-in-law once frequented the place with her brother and friends. She assured me that she has only ever had good experiences there. I don’t doubt it one bit. 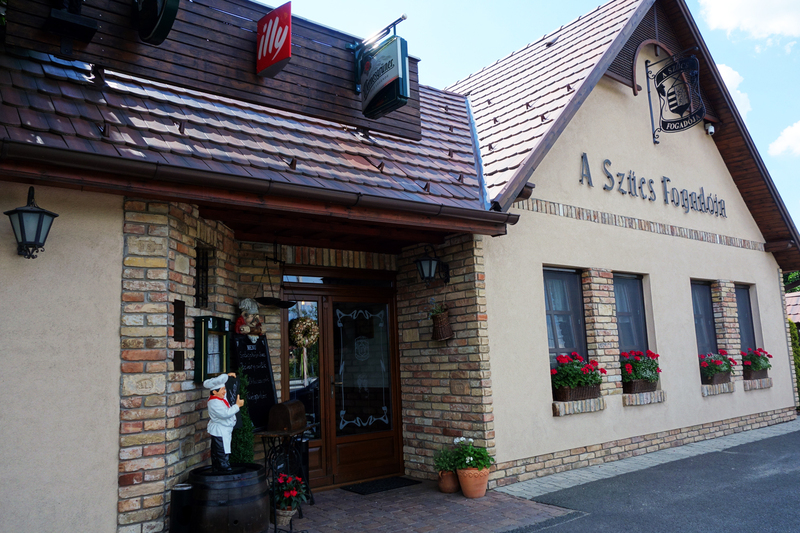 Traditional Hungarian cuisine dominates on the menu at Szűcs’s, both grandma-style comfort food and the more refined restaurant classics. There are also some dishes that experiment with foreign flavors or fuse those with Hungarian favorites. The rustic interior and breezy patio provide charm, while menu section titles add a light-hearted peasant humor to the experience. Poultry, for example, is endearingly referred to as “winged creatures who’ve escaped the fox’s embrace.” One almost feels pity for the “poor aquatic bastards caught on the hook.” To match the varied menu, the restaurant also boasts an impressive collection of Hungarian wines. 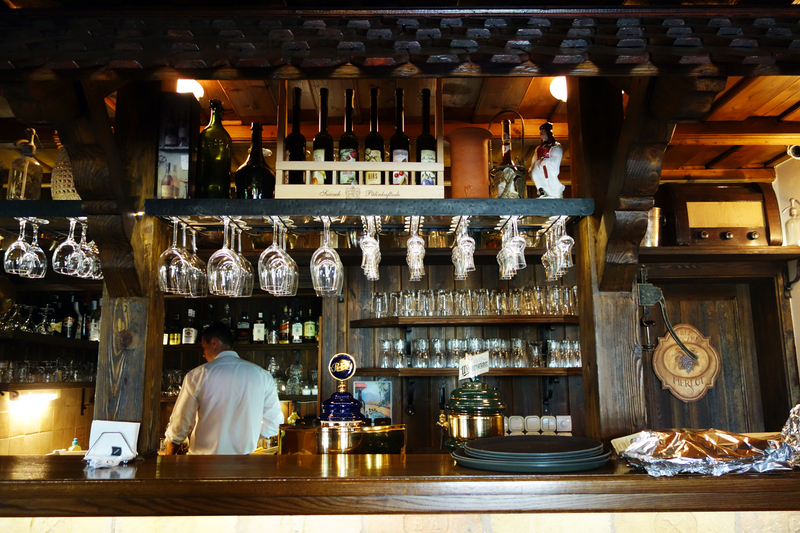 These are listed along with different types of pálinka (fuit brandy) on a combined “Wine and Pálinka” menu; tulip bowl pálinka glasses hang next to wine glasses over the bar by the entrance. I found that pretty cool. And the wine list rocks. The selection is stored and proudly showcased in a backlit cupboard by the entrance. The list provides a detailed paragraph for each bottle, explaining the history of the region and nuances of its terroir, along with brief winemaker stories and tasting notes to simplify the selection process. They have wines from the ever popular Villány, Eger and Buda, along with some lesser known wine producing regions such as Etyek, Szeremle, Szekszárd and Mátra. Servers seem quite informed and are helpful in choosing the right bottle to pair with each dish. Surprisingly, all of their wines are available by the glass as well as by the bottle so mismatching wine to entree for the benefit of the table is not an issue unless you make it one. 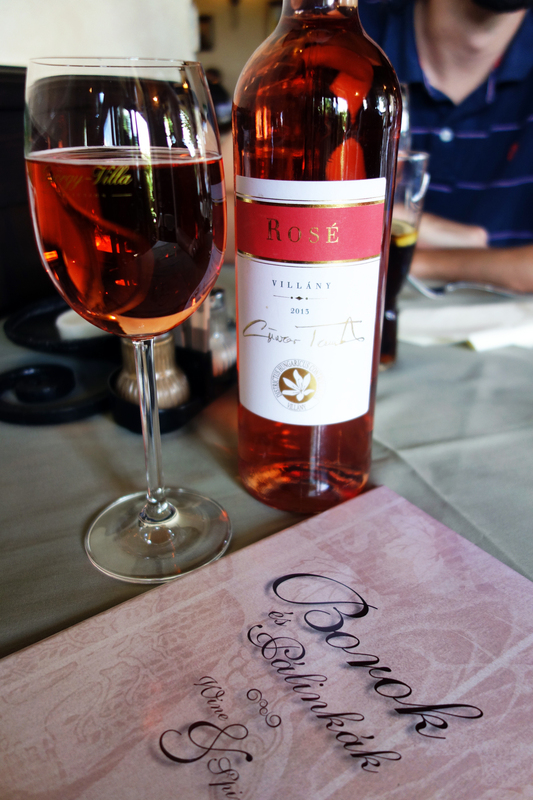 Having never tried a rosé from Hungary, I ordered the 2013 Villány Rosé from Günzer Tamás, a blend of Blue Franc, Pinot Noir and Merlot. It was a dry, yet fruit-forward wine with very light carbonation that made it airy enough to enjoy on a hot summer day. A good table wine for the summer, served chilled. It was great on its own between soup and entree, though didn’t really stand up in body to my paprika laden mains. 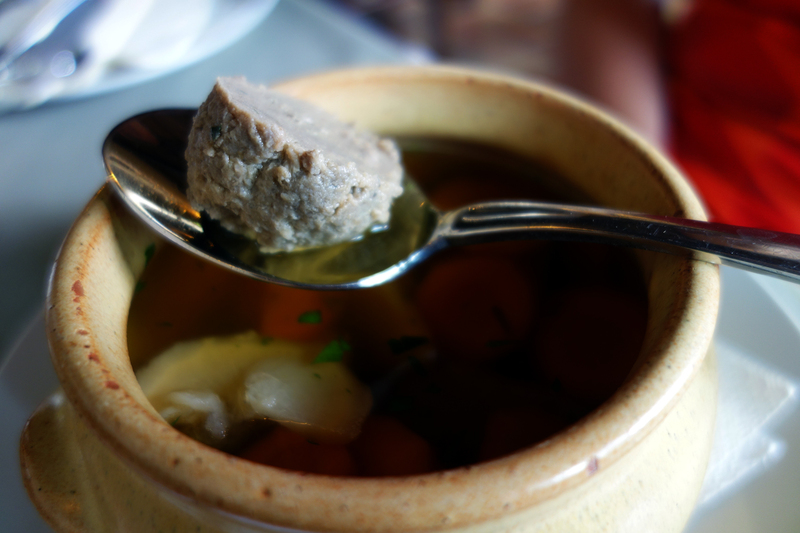 Perhaps the most authentically Hungarian section of menu is that of the soups. Included on this list are the classic paprika roux based mushroom soup and the cold sour cherry soup unique to Hungarian (and maybe Polish) cuisine. 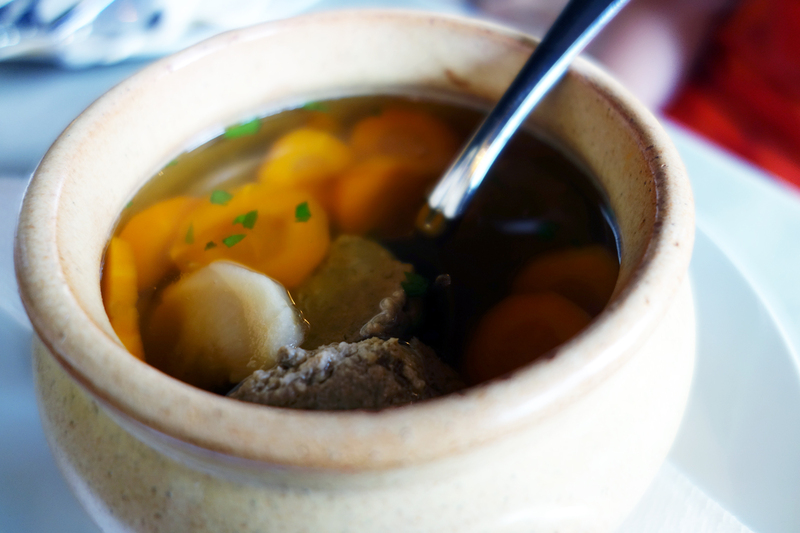 Húsleves, which literally translates to “meat soup” is a broth made of one or more types of protein and veggies stewed for ages and then removed to produce a clear broth, which is simple but nevertheless packed with the essence of its ingredients. There are 3 or 4 of these on the menu at Szűcs’s, those with the veggies added back to the broth, those with different part of the meat also present. 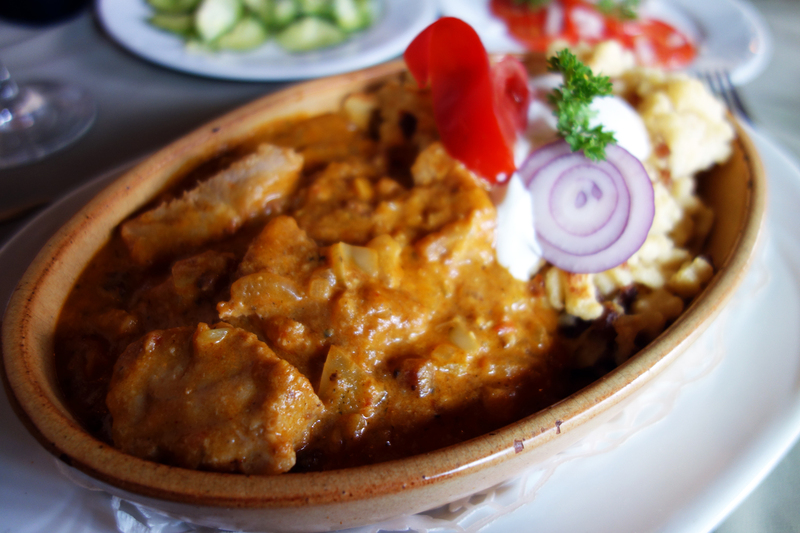 We ordered the húsleves with májgombóc, which are dumplings made with chicken liver, egg, breadcrumbs and seasoning. When made correctly, as they were in this case, májgombóc is ethereally light and fluffy, slightly suspended in the hen broth rather than sinking to the bottom. There were also tender slices of woodsy parsnip and sweet carrot, which rounded out the slightly mineral flavor of the liver. Delightfully light despite the depth of its flavor, this is a great summer option, inducing the appetite for more rather than suppressing it. The last time I had this dish was at the Smithsonian Folklife Festival last summer, when it was prepared by a Hungarian festival participant as part of a cooking demo. It was made, however, with ingredients acquired in the U.S. and thus could not measure up to the original, which Szűcs’s version is a perfect representation of. A crucial part of any Hungarian menu is savanyúság (pickled vegetables), which are much more prevalent than fresh salads in our cuisine. The acidity of these is almost necessary to balance out heartier entrees, which are almost always lard based and seasoned heavily with smoky paprika. Any proper market in Hungary has a stand dedicated to pickled vegetables, which include cabbage, cucumbers, kohlrabi, cauliflower, hot peppers, apple peppers and any combination of these. One of my favorite pickled vegetable “salads” is one consisting of cucumber ran through a mandolin. The thin slices are pickled slightly in vinegar and a bit of sugar. The salad is topped with a dollop of sour cream, paprika and cracked black pepper. 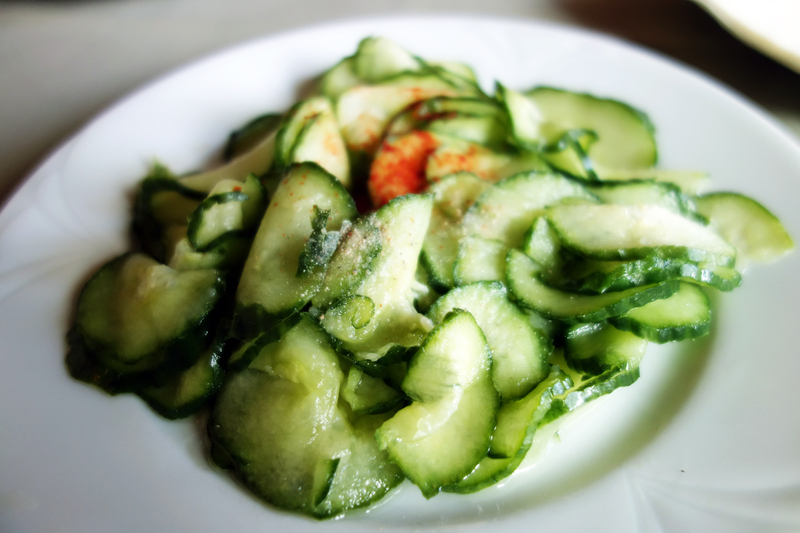 Szűcs’s version shows a good marriage of flavors, the cucumbers soak up the vinegar, which pickle it slightly. The slices aren’t too thick but thick enough to retain a crisp texture. 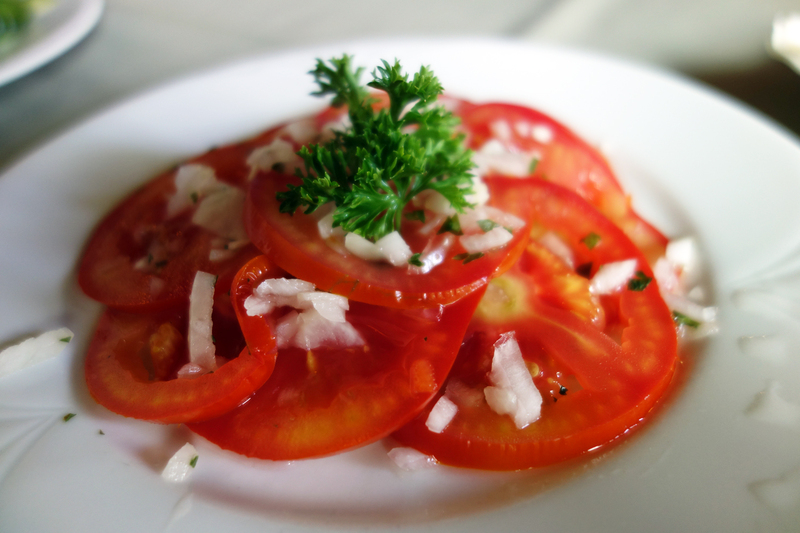 A favorite savanyúság of my sister-in-law is the tomato salad, sprinkled with chopped white onion and marinated slightly in the same vinegar and sugar mixture. In this case the natural sweetness of the tomato enhances the sweetness of the dish and not too much vinegar is added so that the perfectly ripe midsummer fruit can show of its fullness of flavor. Tomatoes in Hungary towards the end of the summer are one of my favorite and most dearly missed foods. Salads like these are a perfect way to focus on and appreciate them fully. Both salads went fantastically with my entrée, a dish I had been craving since my arrival home. A paprikás is a type of stew made with a paprika seasoned roux, sour cream to lighten it and some sort of protein. Perhaps the most well known version is “chicken paprikash,” prepared with a bone−in, skin−on stewed chicken thigh and served with galuska ⁄ nokedli, The latter is a sort of egg pasta with not too much flavor but with a slightly chewy texture, perfect for soaking up the flavor of a sauce, such as the base of a paprikás. 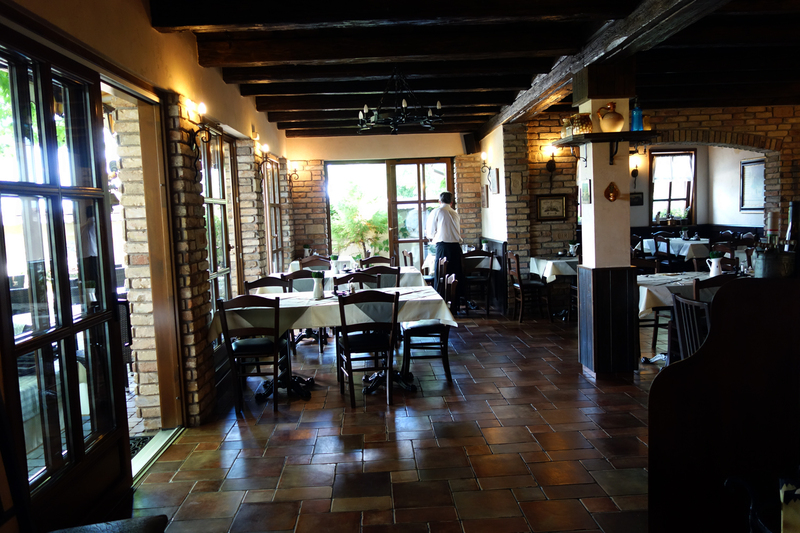 At Szűcs Fogadója, I ordered a Harcsapaprikás, which is the classic stew made with what is perhaps considered landlocked Hungary’s national fish, catfish. Hearty, deboned chunks of the slightly slimy river fish are cooked to a texture where the flesh is pleasantly soft and loose but firm enough still not to fall apart and melt in the thick stew. Szűcs’s paprikás base is flawless, seasoned with good quality paprika. A generous amount of peppers and onions round out the flavor, while sour cream makes the sauce luscious and creamy. What I especially enjoyed was the way the little bits of pörc (fried fat back) added a smoky, salty, porcine flavor to the dish, balancing the hint of muddy flavor so characteristic of Hungarian harcsa. The latter is a taste that those who have grown used to marine fish are often quite intolerant of, but which I personally enjoy in small doses. The flavoring of the stew is thus crucial in allowing just the right, not overwhelming amount of this muddy, dirty flavor to remain. Served with the paprikás of catfish was a side of galuska prepared in a style that is often misnamed strapacska after the Slovakian strapačky, which traditionally includes cabbage in the recipe. 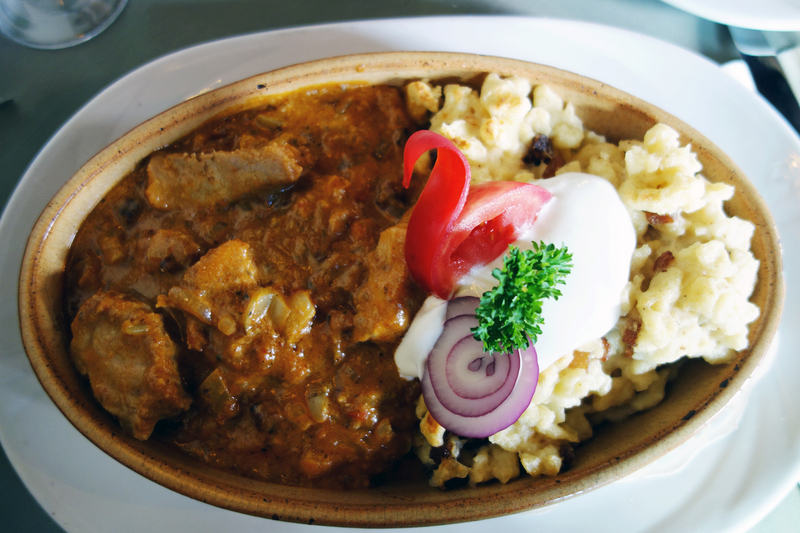 Hungarian strapacska is more like an Austrian spaetzle and comes with plenty of tangy ewe’s milk curd and the aforementioned pörc mixed in. It’s baked until the flavors marry and until the curd glues together the bits of galuska into a single mound. I couldn’t have imagined a better companion to the creamy paprikás. The fresh, cool acidity of the curd contrasted sharply with the deep flavors of the sauce and also did its part in cleaning up the flavors of the catfish. The bits of bacon inundated the galuska with its smoky, salty flavor even before the sauce from the paprikás could soak into the bland but pleasantly chewy little pillows of dough. 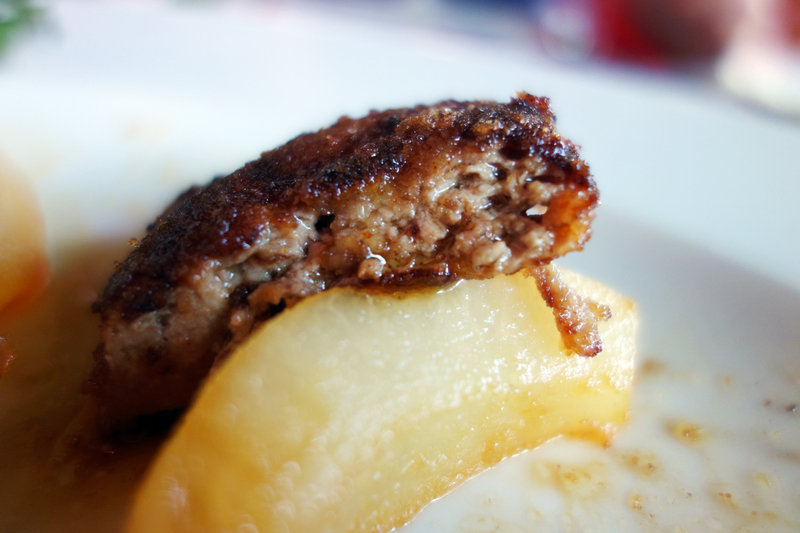 We also shared the goose liver, which my sister-in-law insisted Szűcs’s kitchen masters each time. From the 3 or 4 variations that appeared on the menu, we chose one served with caramelized pears and creamy mashed potatoes. 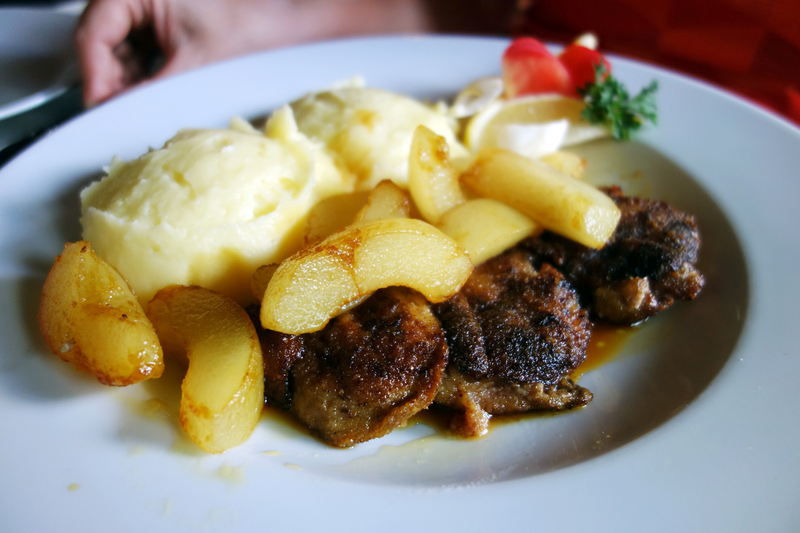 Hungarians know a thing or two about goose liver, which we consume quite a lot of almost exclusively at restaurants. It is most commonly served smoky and paired with something fruity and sweet – but not too fruity or too sweet – on the side. A classic, dating back to our pre-socialist monarchy era, is smoky grilled liver served with sticky sweet Tokaji, our nobly rotted national dessert wine. In the goose liver dish at Szűcs Fogadója, the caramelized pears plays the role of dessert wine, the sweetness balancing the smoky char coating the fluffy pillows of liver, while the acidity cuts the buttery fat, of which there is plenty. A very happy marriage of flavors, indeed. The pears are cooked fork-tender, only slightly firmer than the liver, which unfolds into fluffy blobs of velvety smooth meat pudding on the tongue. The creamy potatoes soak up the precious gold grease pooling under the goose liver and the fruity sweet syrup of the pear. My brother ordered one of the restaurant’s spring time suggestions, an oven baked lamb shank served with potatoes seasoned with rosemary sour cream. The dish was more mildly seasoned than the other two, allowing those charismatic mineral flavors of the lamb flesh to shine through in all their glory. 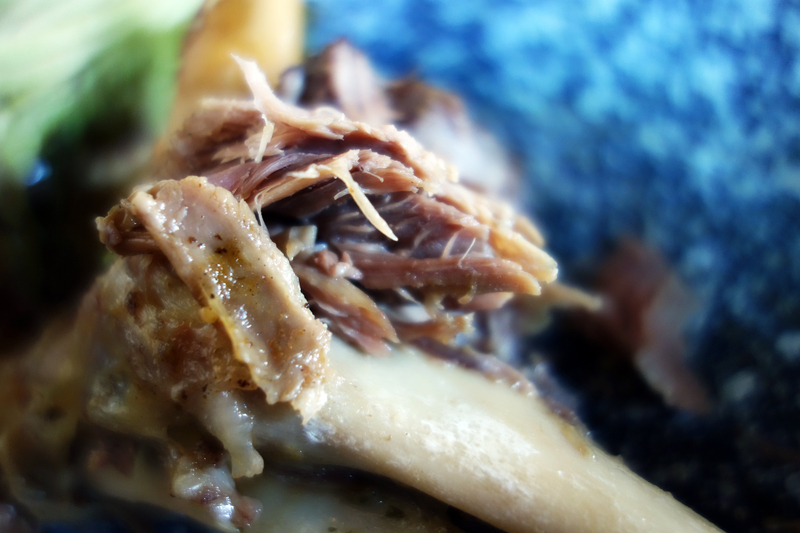 A wonderfully flaky, tender piece of meat that fell apart with minimal coercion from my fork, the lamb was a joy to try. It had been baked masterfully and remained juicy moist to the last bite. 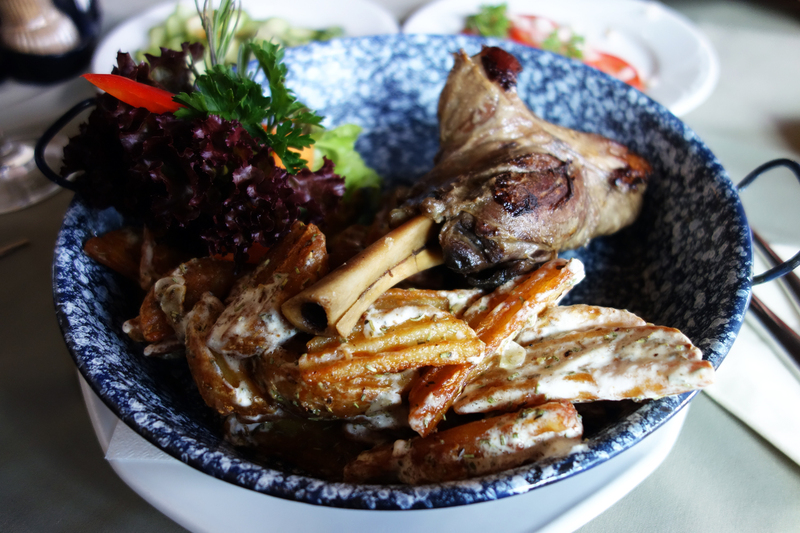 All of the lamb’s natural flavors stayed tightly packed into the bone-adjacent meat. The spuds were great too, crunchy along the edges but quite meaty on the interior. They were cut into ruffled slices and the grooves soaked up the garlic and rosemary infused sour cream, as well as the residual meat juice dripping off the savory shank. A quick sight-see in Gödöllő lends the perfect opportunity to walk off lunch and to refuel on espresso and ice cream at one of the many little confectionaries before hitting the road back home. July 31, 2014 in HUNGARY.